My last blog about Perennial China Retail Trust presented an example of a Chinese real estate IPO designed to enrich the sponsor rather than investors. Another recent, self-serving IPO focused on Chinese real estate is Hui Xian Real Estate Investment Trust, which is focused exclusively on Bejing’s landmark Oriental Plaza. Oriental Plaza is a 787,059 square meter (8.5 million square feet) mixed-use complex in the Dongcheng district west of the Beijing CBD. Oriental Plaza is partly owned by billionaire Li Ka-Shing, Hong Kong’s wealthiest man and no. 11 on the Forbes billionaires list. His organization is known as Cheung Kong Holdings. Much as Warren Buffett holds “sage” status in the U.S., Li Ka-Shing holds “Superman” status in Hong Kong, bringing instant credibility to his IPOs. An investor has to first ask, though, what the reason for the IPO may be. The property is already acquired and has performed very well to this date. Mr. Li is not adding to his stake in Hui Xian. If anything, he is lessening his stake, as the use of the proceeds is to reduce bank debt and intracompany indebtedness (to Hui Xian Cayman, a wholly owned subsidiary of Hui Xian Holdings, which is 33.4% owned by Cheung Kong Holdings), which not coincidentally reduces the debt levels and increases the net asset value of Cheung Kong Holdings. Better yet, going public has also allowed the owners to be paid a "pre-listing distribution" of the "revaluation surplus" of RMB 7.3 billion (>$1 billion USD) due to the property being valued at RMB 31,410,000,000, even though the IPO priced Oriental Plaza at RMB 26.2 billion to 27.9 billion (why so low if the property is really worth 31.4 billion yuan?). Moreover, the owners hired a different valuer for the IPO valuation even though they had just had the property appraised for RMB 20 billion on October 31, 2010, an increase of RMB 8.8 billion from the end of 2009. The new valuation, done three months later by a member of both the Royal Institution of Chartered Surveyors and the Hong Kong Institute of Surveyors, was 57% higher, although mall rents had only gone up 6.7% in the previous year and office rents had gone up just 1.9%. It all looks suspicious when the distribution of a huge revaluation surplus is dependent on such a high valuation. The last DTZ valuation from October 31, 2010 explained the big increase in value to RMB 20 billion from RMB 11.2 billion as the result of declining capitalization (yield) rates, with the yield rate on The Malls moving down from 10.5% to 8% and the yield rate on The Offices moving down from 9% to 7%. 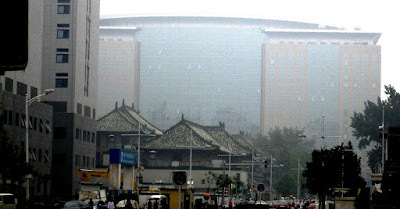 The new valuation by American Appraisal China, on the other hand, applies even lower but contradictory yield rates, with the report stating that the respective yield rates on The Malls and The Offices as 6% and 5.5%, but the Valuation Certificate stating yield rates as 5% for The Malls and 4.5% for The Offices, indicating some change of heart during the valuation assignment. The valuation report does not present evidence for a 4.5% yield rate for offices. As a point of reference, the Japan Real Estate Institute's Global Real Estate Markets Survey of 105 firms, published in May 2011, indicated a prevailing yield rate of 7% for Beijing offices, 7.1% for the CBD, up from 6.5% six months previously and 6% one year before. In addition, the decrease in yield rates alleged by the new valuer seems to be at odds with the Chinese government increasing interest rates 5 times in the last eight months. There is usually some correlation between yield rates and interest rates. As for the Direct Comparison portion of the valuation report, I was surprised to find so much of the "comparable" data consisted of asking prices rather than closed prices. This "pre-listing distribution" of "the revaluation surplus" is part of the debt that was retired by the proceeds of the IPO. This is what allowed the owners to pocket over $1 billion in phantom capital gains immediately prior to public trading. If Superman is reducing his stake in Hui Xian, why should we be buying? One advertised virtue of the offering was that it was the first yuan-denominated offering outside China, allowing Hong Kong and offshore investors to invest yuan deposits that would otherwise yield lower returns in bank interest or in “dim sum bonds”. The anticipated yield was 4.26%. The offering was subscribed at RMB 5.24 per share, but plunged 10% on the first day of trading in April. The last trade on July 5th was RMB 4.69, about 10.5% below the original offering price. The IPO prospectus only had financials until October 31, 2010. For the first 10 months of 2010 compared to the first 10 months of 2009, revenues were up for the malls and the hotel but office revenues decreased from RMB 563 million to RMB 542 million and apartment revenues declined from RMB 82 million to RMB 74 million. Overall revenues were up, nevertheless. Perhaps someone at Hui Xian Holdings saw strong headwinds coming their way. For instance, Years 2011 and 2012 will have numerous tenancy expirations, including more than 99% of the office tenants, 67.4% of the retail tenants, and more than 99% of the apartment tenants. Also, despite double digit growth in retail sales, the amount of retail space inventory has been increasing even faster in Beijing, and the local retail vacancy rate was last measured at 24%, although it is a much lower 7.52% in the Dongcheng district that contains Oriental Plaza. In the last 3 quarters of 2010, added new supply was about three times absorption (also known as “take-up”). So far, this has not affected the Malls at Oriental Plaza (completed in year 2000), which enjoy an unparalleled location in a prime tourist and office area. Oversupply is always bound to hurt even the best retail properties. As for office space in Central Beijing, the growth in demand has recently exceeded the growth in supply, with the vacancy rate declining into single digits and average rents of $29.35 psf per year in U.S. dollars. As for the Dongcheng District, the nearby new supply will not be directly competitive. The difference between the Dongcheng district and the central business district seems much like the difference between the Chicago CBD and its Magnificent Mile, considering that Dongcheng is situated next to the premier Wangfujing retail district in Beijing. My hotel in Dongcheng was near a Bentley dealer, for instance. There is nothing to suggest that Oriental Plaza is suffering any problems at the moment, but the fact that “Superman” Li is reducing his stake and cashing out a “revaluation surplus” should not be an encouraging sign to investors. Considering that Oriental Plaza was valued at RMB 31,410,000,000 but market capitalization of the trust was never that high and has now declined to RMB 23,550,000,000, perhaps that imaginary RMB 7.3 billion revaluation surplus should be returned to investors.